user warning: Table 'drupalgastronomer.comments' doesn't exist query: SELECT COUNT(*) FROM comments c WHERE c.nid = 161 AND c.status = 0 in /home/dgabriner/gourmetgastronomer.com/modules/comment/comment.module on line 992.
user warning: Table 'drupalgastronomer.comments' doesn't exist query: SELECT c.cid as cid, c.pid, c.nid, c.subject, c.comment, c.format, c.timestamp, c.name, c.mail, c.homepage, u.uid, u.name AS registered_name, u.signature, u.picture, u.data, c.thread, c.status FROM comments c INNER JOIN users u ON c.uid = u.uid WHERE c.nid = 161 AND c.status = 0 ORDER BY c.thread DESC LIMIT 0, 50 in /home/dgabriner/gourmetgastronomer.com/modules/comment/comment.module on line 992. It’s somewhat ironic that though I’ve cooked quite a bit since I last wrote, I have little to offer today. We were too busy eating and talking to document, which is something you can never be too sorry about. Plus, as usual, I learned that I wanted to tweak the Moroccan lentil soup a bit, change spices, add salt, smooth it out to make it velvety. It wasn’t enough. So instead, I have something that you should try. 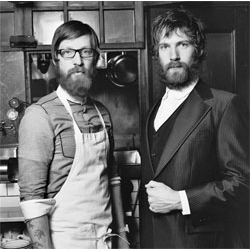 You may have seen the article in the New York Times food section last week on the foodies in Brooklyn. Typically bearded and back the land, these people are doing small scale, artisan things of varying kinds. Although it all can get a little precious sometimes, I still love to see people doing artistic things that also happen to be edible. Plus, I think as long as the righteousness level remains low, the values and considerations that they offer up are important. At any rate, on the very day that article came out, I received a little package from my aunt. 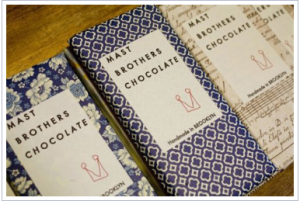 There it was, a beautifully wrapped chocolate bar, with almonds and sea salt, from, of all places, Mast Brother’s Chocolate. I’ve just moved to Brooklyn, where this chocolate is made, so it’s officially local. And, since I’m local and now have my very own “eat in” (this is a very flexible term in New York) kitchen, everything will be kicked up a notch. I’m even going to invest in a spice rack. Home sweet, peppery, cumin-scented home, here I come.